The ECAMPUS UNIVERSITY was created as an online University and recognized by the MIUR (Italian Ministry of Education, University and Research) by the Ministerial Decree of 30 January 2006. It was formed with the aim of providing access to university through its eLearning platform to young people, professionals, entrepreneurs, executives and business and cultural actors in order to contribute to the labor market. The headquarters, also known as Milan International Campus, or Campus of Novedrate, is located in the ex IBM training center of Novedrate (Como, Italy), on a campus in the quiet green Brianza. The University has 5 Virtual faculties: Engineering, Economics, Psychology, Arts, Law. 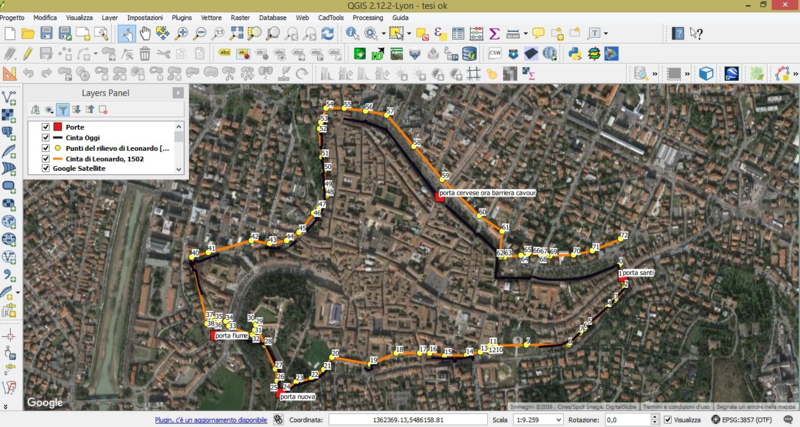 THE HISTORICAL MAPS AND THE QGIS PROJECT The City Wall characterizes the city of Cesena. Its scorpion shape divides the historic center from the newly zone. The historical cartographic documents describe its evolution and its destructions. The QGIS program allow me to compare different historical maps, because it permit to transfer all the maps in the same Reference System, with the georeferencing plugin. As a reference the open layer Google Satellite and the open layer Open Street Map have been used to refer all the historical maps to the Reference System EPSG: 3857 (Web Mercator or Pseudo Mercator). QGIS has been a fundamental tool to elaborate, analyze, compare these georeferenced maps through the vectorial layers or shapefiles, in which I memorized all the elements ofthe maps, such as roads, buildings, parks and gardens, City Wall, the ancient fortified towers and the ancient City Gates. I used puntual, linear and polygonal layers. I compared these layers through the analysis, research, geoprocessing, geometry and data management tools (Fig. 1). Fig. 2: Openlayer Google Satellite overlapped by the informations recorded in different layers: the present City Wall in black, the Leonardo Da Vinci’s topographic survey of the City Wall in orange, the Leonardo Da Vinci’s points of survey in yellow and the present ancient City Gates in red. Fig. 3: The 3D model of the present City Wall and Cesena’s buildings inside and outside the Wall. The ancient fortified towers and the ancient City Gates are indicated. The historical maps are important documents even if its precision cannot be compared to the precision of the actual cartographic document, and they are very communicative representations also for those who are not specialists on geographic representations. QGIS was the only means that allowed me to use the numerical content of the historical maps according to an effective and meaningful representation. Camilla Fabbri has a bachelor’s degree in Civil and Environmental Engineering. She has developed her dissertation on historical cartography of the Cesena Wall using the QGIS program with the Supervisor Alessandra Borghi, who is the University Teacher of Topography and Theoretical Mechanics of the bachelor’s degree in Civil and Environmental Engineering in the eCampus University.